Avani Mooljee has always been interested in the connections between countries, largely due to her own experience as an Indian-American who grew up in Zimbabwe. During her eight years at the Harare International School, she was frequently exposed to and inspired by the collaboration between US diplomats and Zimbabwean foreign nationals working together to combat hyperinflation and strengthen democratic systems. Avani completed her B.A. in International Relations with a minor in Political Science from Rollins College in Winter Park, Florida where she was an active participant in several local and international initiatives. She was one of ten members of the inaugural Bonner Leaders cohort where she worked closely with students on the autism spectrum during and after her undergraduate career. She served as President of Rollins’ Amnesty International chapter for two years and interned with the American Red Cross in Washington D.C. As an avid member of Model United Nations, she won multiple awards as a delegate and as a Chair during conferences in Zimbabwe, South Africa, Jordan and New York. These conferences enhanced her ability to negotiate with other countries on pertinent international issues and to write persuasive resolutions, skills she will bring into her career as a Foreign Service Officer for USAID. Avani joined the Peace Corps shortly after graduating and served in the Dominican Republic as the first Volunteer in her community on the Dominican-Haitian border. Throughout her two years there, she taught Spanish literacy to adults and children, and English to high school students who asked her to start a class. She also worked with the Ministry of Education to improve monitoring and evaluation tools to decrease illiteracy in her region. When she wasn’t working on literacy promotion, Avani enjoyed learning how to box from a local youth group and exchanging delicious recipes with doñas in her community. 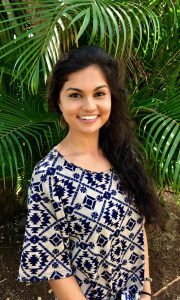 Avani will pursue graduate studies in humanitarian policy, specifically regarding international conflict resolution. She is honored to be selected as a 2019 Payne Fellow and extremely excited to become a USAID Foreign Service Officer in the Democracy and Governance backstop.